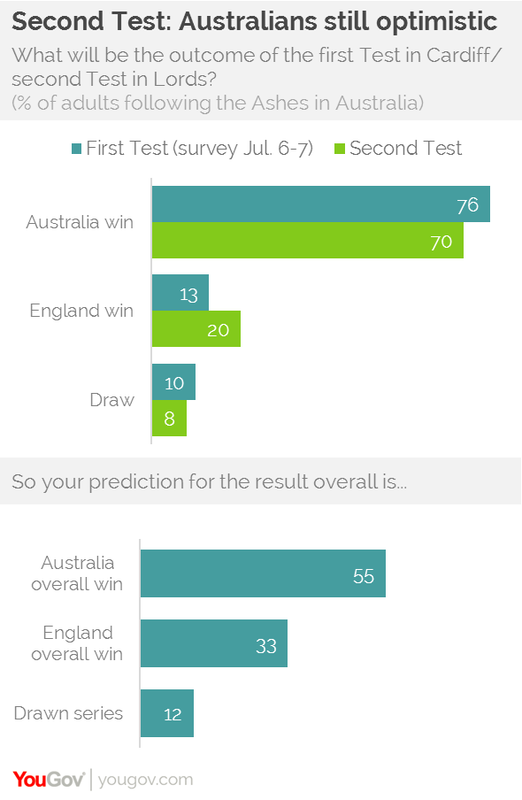 on September 8, 2015, 8:15 p.m.
YouGov’s last survey following the Ashes 2015, conducted ahead of the first Test in Cardiff, found Australian cricket fans overwhelmingly optimistic with 76% expecting their side to win the Test. And following a 169-run victory for England, Australians are hardly feeling humbled. 70% of Australians who are following the Ashes say their side will defeat England in the second Test at Lords, which begins on Thursday. 20% expect an England win, which is also up slightly from last week when only 13% gave England the edge. Yet Australians expectations have fallen more significantly when it comes to their prospects for the whole series. Last week 81% of Australian cricket fans expected to win three or more Tests out of five, and now only 46% expect that. Even so, the majority – 55% – still hold the view that Australia will win overall, against only a third who favour England’s odds. The survey also shows the rumoured decision by Australia to drop all-rounder Shane Watson for the second test will be popular at home. 53% of fans favoured leaving the 34-year-old Watson out of the Australian XI. None of the other options – Brad Haddin, Adam Voges and Mitchell Starc – got more than 6%.